Phenolic resins can be used to impregnate a range of different substrates used in the manufacture of electrical laminates. Electrical laminates are used in various applications from electronic parts in printed circuit boards to electrical isolation materials used in transformers, generators and electrical machinery. Laminates with electrical isolation properties are also used in the textile industry, particularly in tubes, as a result of their high dielectric strength. Electrical laminates are manufactured in accordance to international and national standards. In addition to EN 60893, the USA NEMA LI-1 and German DIN 7735 standards are of particular importance. Both unmodified and modified phenolic resins may be used, however typical for all resins used are the very low amount of electrolytes resulting in laminates with very high dielectric strength. The substrates are impregnated with large amounts of resin which makes the laminates hydrophobic. Typical electrical laminates are produced in three separate steps; impregnation, pressing and finishing, in similar manufacturing processes to other types of paper based laminates. In the impregnation process, the substrate (e.g. paper, cotton fabric, glass) is transferred to an impregnation bath containing the phenolic resin and the desired amount of resin is absorbed. After drying the impregnated substrate (prepreg) is cut into sheets or wound onto rolls. For special laminates impregnation occurs in several processing steps with a drying step in between. The first impregnation step allows a low molecular weight resin to penetrate into the core of the substrate. This is followed by a second impregnation step which coats the surface with either a modified or unmodified high molecular weight resin. The prepreg is then further laminated in multi-daylight presses depending on the final application e.g. for copper cladded laminates a very thin copper foil is included. For the production of laminated tubes the prepreg is wound onto a pre-heated steel core against heated counter pressure rolls. The resulting laminated rolls are post cured at 150 – 180°C for several hours. The cured laminates are finished according to their end use. 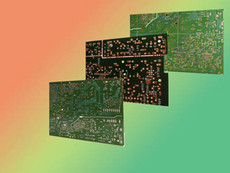 Copper clad laminates to be used as printed circuit boards are printed, etched and punched. Tubes and plates used for insulation are finished in standard mechanical process such as sawing, milling and turning. The requirement for high temperature stability, non-flammability and low water absorption makes phenolic resins the ideal choice for the manufacture of electrical laminates.